We are your #1 Middle Tennessee Appliance Repair Company. We service all Major Appliance brands. SAME DAY SERVICE AND EVENINGS AVAILABLE! Licensed and Insured. Call us anytime (615) 410-2016. Our factory-trained technicians will be dispatched promptly to your home. We are fully certified, licensed, insured and factory-trained. Our exceptional customer service along with our knowledgeable and friendly staff makes us the best choice in appliance repair. 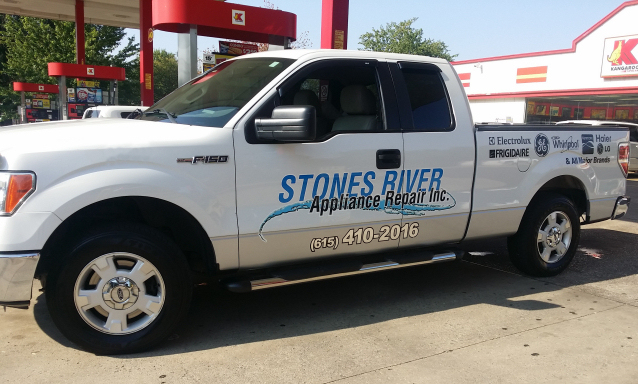 Stones River Appliance repair trucks are stocked with the most common replacement parts for all leading manufacturers. All of Stones River Appliance’s technicians are company employees (NOT sub-contractors). We all live and work in and around the Murfreesboro, TN area. Our service area includes Murfreesboro and the surrounding Middle Tennessee area. Our technicians are factory trained on most brands of major appliances; refrigerators, laundry products, dishwashers, and ranges. To give personalized service to each and every one of our customers. Discussing all charges up front – no hidden or unexpected costs. To provide professional service, with the customers needs always coming first.